After you have uninstalled an application, you can delete it from Cloudify Manager. After you uninstall an application, all of its static and runtime properties are still stored in the Manager’s database and the deployment-specific agents continue to consume resources on the Manager. Deleting a deployment enables you to clean the environment of those excess artifacts. -v, --verbose - Show verbose output. You can supply this up to three times, for example -vvv. -f, --force flag - Delete the deployment even it contains active nodes. 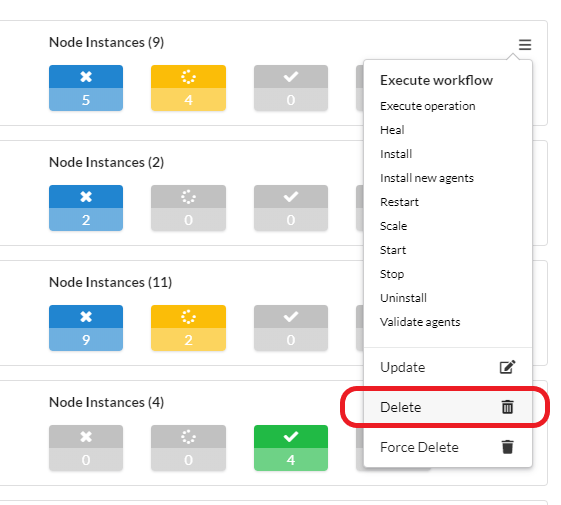 Go to the Deployments page and open action menu ( icon) on the relevant deployment and click Delete. Go to the Deployments page, click on the relevant deployment and on deployment drill-down page click Delete deployment.